You can make this in literally 15 minutes — the time it takes to cook your pasta. Click here to view a large version of this picture. Prepare pasta according to package directions. Cook until al dente, then drain. Reserve 4 tablespoons pasta cooking water. Set aside. Warm olive oil gently over medium heat. Add garlic and cook until garlic takes on a little color, about 1 minute. Add anchovy to the pan along with red pepper flakes. Mash anchovy with the back of a wooden spoon. 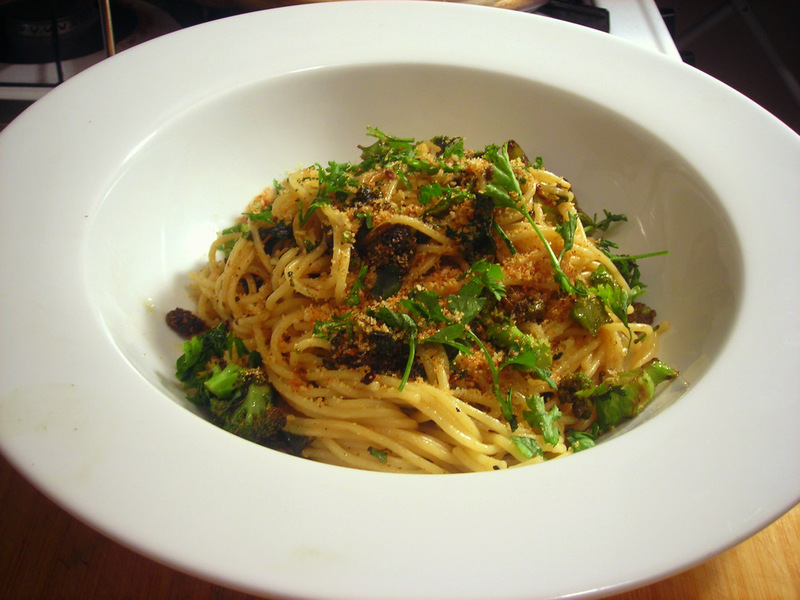 Anchovy will disintegrate into the sauce. Add broccoli and cook until broccoli becomes tender, stirring frequently, about 3 to 4 minutes. Taste for salt and pepper. Add cooked pasta to the pan. Toss to coat. If pasta seems too dry, stir in reserved pasta cooking water, tablespoon by tablespoon or until sauce reaches the desired consistency. It will be rather thin, however. Stir in chopped parsley and fried breadcrumbs (these are simply breadcrumbs that have been fried in a little bit of olive oil, then seasoned with salt, pepper and minced herbs such as parsley, thyme or marjoram). Taste for salt and pepper once more, then serve immediately. Time: 15 minutes, including prep. Fried breadcrumbs can be made ahead. Note: Omitting the anchovies will make this dish vegetarian. This is my submission for Presto Pasta Nights #234, a weekly foodblog event currently hosted and organized by Ruth of Once Upon a Feast. 05 Oct	This entry was published on October 5, 2011 at 2:33 am. It’s filed under food, Italian food, Presto Pasta Nights and tagged broccoli, dinner, food photography, pasta, rocambole garlic. Bookmark the permalink. Follow any comments here with the RSS feed for this post. Beautiful! I love anchovy-and-garlic combo in Italian food – it never fails. And with breadcrumbs… mmm! this one sounds like one of the best ones yet. I’m with Urspo – this one does look like the best yet. Of course I say that every time I visit 😉 Thanks for sharing with Presto Pasta Nights. Always a treat when you join the party.